It's a Mad, Mad, Mad, Mad World meets The Maltese Falcon with plenty of jokes and gags to keep you laughing out loud. If you loved Who Framed Roger Rabbit or Zootopia this is the audio adventure for you! The Case of the Cursed Dodo is a hilarious throwback to old time radio serials starring a hardboiled Winnie-the-Pooh. His name's Jake G. Panda, and he's a wildlife investigator. He works at a flophouse for endangered critters called the Last Resort. He's the hotel snoop. The resident fuzz. It's his job to keep these unusual guests safe and out of harm's way. This first installment of The Endangered Files is a wild and woolly mystery involving a missing guest, a green bird, and a bunch of double-crossing critters all hot on the trail of a valuable artifact called The Cursed Dodo. This audiobook is designed to introduce young listeners to the subject of endangered species in a fun and informative way. So join this tough talking panda detective and a cast of endangered creatures on a globe-trotting audio adventure that will appeal to the kid in all of us. The complete list of narrators includes: Michael McConnohie, J.W. Terry, Dave Mallow, Molly Brandenburg, Antoinette Attell, Ian Whitcomb, Barbara Watkins, and Bobb Lynes. 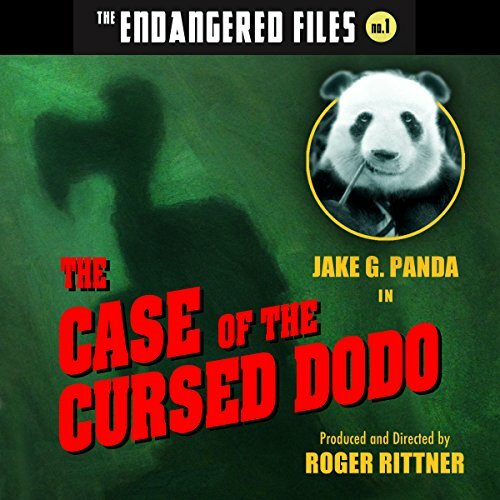 Would you consider the audio edition of The Case of the Cursed Dodo to be better than the print version? Have only listened to the Audio..... My suspicion is that kids would enjoy the Audio more after reading the book. What other book might you compare The Case of the Cursed Dodo to and why? Sort of a animated version of many of the classic detectives. The variety of narrators bring depth to the story especially to children. The entire book is a delightful experience that anyone could enjoy. Very fun format - more like listening to a movie than a book. Kids would love this one full of lot of animals and action and sound effects! I strongly recommend others to download and listen to this! What an original story! We meet Jake, a hard boiled panda detective, who's hot on the trail to solve a mystery, and to save endangered species while he's at it. Completely imaginative tale, with a wide range of different characters/animals. Full of puns (which I love if handled masterfully, and Jake does not disappoint). The sound effects, added music, enhanced background accents were right on the money as only this experienced, talented producer knows how to do. Each scene, every chapter was brought to life, sparkle, and adventure by this fantastic achievement. Can't wait to hear more of Jake G. Panda's tales. This was classic, and FUN! A cast of characters that include many endangered species, mystery, action, adventure, this book has it all. Add to that an ensemble of narrators, music, and sound effects, and you get a very enjoyable listen. This was an intersting and unique audio book. It is performed by all kinds of people and was very reminiscent of the old radio dramas (i.e. War of the Worlds). Definitely worth checking out. The first thing that comes to mind after just a few minutes of listening to "The Case of the Cursed Dodo" is "The Maltese Falcon" and Humphrey Bogart:) The book has that unforgettable feel of movie adaptations of hardboiled fiction, and Jake G. Panda reminded me of Bogey right from the start. A definite must for young (and not so young:)) kids. really enjoyed listening to this book narrators kept me giggling, intrigued story kept me hooked really easy to sit and just laugh. This book was given to me for free at my request and I provided this voluntary review. What did you love best about The Case of the Cursed Dodo? The various character voices were nice; it made it easier to keep track of who was speaking. I also enjoyed the cliche, goofy jokes. I chuckled many times while listening. I really liked the quick summaries at the beginning of each chapter. Even though I literally just listened, it helped sort of reel me back in and keep me on track. I found the story to be entertaining and it had some plot twists that kept me engaged. What was one of the most memorable moments of The Case of the Cursed Dodo? Well, I'll try to describe it so that I don't spoil anything, but so that those who have read it know what I'm talking about... The scene at the end with Jake and Daisy, when she has the item from the box. Then, the very end when we find out more about the item. That plot twist was my favorite, and I thought it was pretty clever. Yep. The "movie script reading" style was great. I enjoyed the pace of the narration and the pace of the story. No. I have an hour commute, so it took me three rides to listen to it all. If I had time I would have loved to listen to it all; it was hard to turn it off an go into work. Next long road trip with my girlfriend, we might give it a shot. I did have a few criticisms on the "performance". The scene change noise (two camera shutters) was annoying; I appreciated the notification of a scene change, but it should have been a different noise. Also I was not a fan of the sound/voice for text being read. It sounded like someone yelling in an empty auditorium, including the echo. Lastly, some scenes also sounded quite echo-ey, and was distracting. I didn't know how I was going to feel about this book but I found it to be a lot of fun. There were times where I laughed out loud and there were tons of giggles too. The humor, the many voices and the fun storyline made this a great listen. It was easy to picture what was going on while listening and I could easily get a mental image of the characters. The narration was absolutely fantastic! I was voluntarily provided this review copy audiobook at no charge by the author, publisher and/or narrator.